New Orleanians would: To have a party. Or more specifically, to expand the party that was Mardi Gras. They would throw a parade on Friday light, thus making Carnival a longer, five-day celebration. No small enterprise, the new krewe would have to procure enough members and funds to pull off parading and ball productions on a scale comparable with long established organizations such as Rex, Comus and Proteus, but it was accomplished. With the encouragement and support of such local notables as Congressman F. Edward Hebert (who chose the god Hermes as the club’s guiding hero) and Dr. Frank Oser as its first Captain, the organization made its first bow to the public on Friday, February 5, 1937. Chosen to ride as Hermes I was Colonel A. Lee Wiener, and reigning as his queen was Miss Marjorie Lee Smith. As the years past, this individualistic band would add many imaginative traditions as it saw fit. In only their second year, for instance, the krewe introduced to Carnival colored neon lights to outline features of a float. In complement with the flares of the marching flambeaux, this made for a procession like no reveler had seen before. 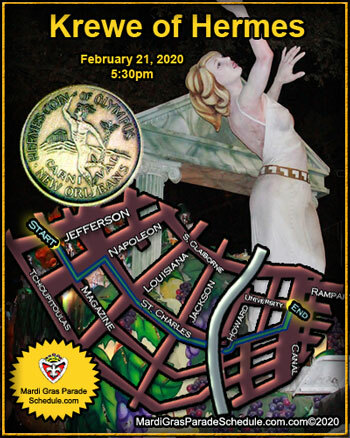 Hermes continues toking bring gaiety and grandness to the Friday night streets and is distinguished as the oldest continuous night parading krewe in Carnival. With nearly 650 members, its roster remains filled with local men of commerce, law, medicine and other distinguished trades. As a mystic organization, the membership is kept secret, a practice which applies especially to the King. Even as he waves his wand before the ballgoers on Thursday night, His Majesty remains behind the mask and his name is never printed in public forums. In 2005, the members were faced with a climate not unlike the days following the Great Depression. Once again, the civically proud, go-getting krewe found strength in misfortune, becoming one of, if not the, first Carnival clubs to reorganize after Hurricane Katrina. Determined that the show must go on, the 2006 Ball and Parade drew record crowds and had them dancing till dawn.